A root canal is a treatment used to repair and save a tooth that is badly decayed or becomes infected. Endodontic treatment is necessary when the pulp, the soft tissue inside the root canal, becomes inflamed or infected. The inflammation or infection can have a variety of causes: deep decay, repeated dental procedures on the tooth, or a crack or chip in the tooth. During a root canal procedure, the nerve (pulp) is removed using small files and the inside of the tooth is cleaned and sealed. 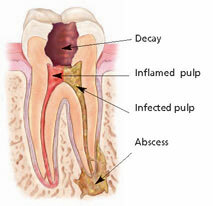 Without treatment, the tissue surrounding the tooth will become infected and abscesses may form. 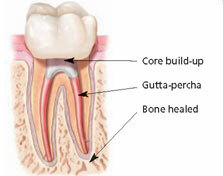 When you undergo a root canal the inflamed or infected pulp is removed and the inside of the tooth is carefully cleaned and disinfected, then filled and sealed with a rubber-like material called gutta-percha.